Bright yellow tigers with upturned vases stuck to their paws; a turtle, shell delicately enamelled and painted with miniatures, sporting the same vase on its back; solid-looking buildings bursting into bloom; cartographical maps depicting vast land masses slowly unravelling to form rivers and pathways for pilgrims ~ these are the first impressions of Tarshito’s work at Arts of the Earth. 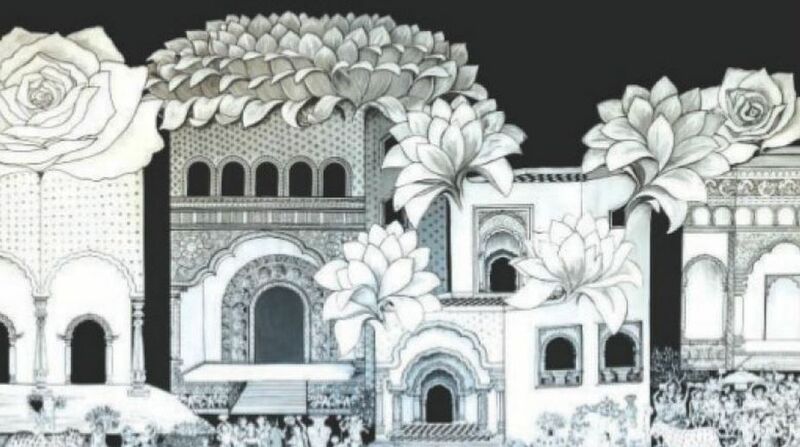 The four regional styles brought together here are Rajasthani miniatures, Orissa Patachitra, Gond painting and Bengal Patas, in highly evolved narrative and implication. Be that as it may, it would yet be insufficient to limit interpreting Tarshito solely on the basis of these, without introducing ourselves to the essence of Tarshito’s philosophy and art. Multi-faceted artist Nicola Strippoli was born in Corato (Apulia, Southern Italy) in 1952. This 57-yearold artist rechristened himself Tarshito from Sanskrit in 1979, after he was introduced to the language during his numerous trips to India. Learning Sanskrit was one of the ways in which Tarshito explored the evolution of ancient Indian cultures and its reflections on the rural craft and livelihoods, helping him forge close friendships with artisans and reviving rare crafts. Tarshito in Sanskrit means “thirst for inner knowledge”. Freshly graduated from the University of Architecture in Florence, still preoccupied with the ideas of radical architecture, he was then travelling towards the Orient in search of inspiration. Spiritual India was not something he had actively sought, but as in all true encounters, had simply stumbled upon. Pune was the beginning of the journey which still continues, regardless of fashion, ups and downs of various isms, or the world’s interest or indifference, even as he continues to exist within his personal mandala, an icon of his inner space ~ the silent and empty “centre” that marks his idea of God. Architect, designer, artist, Tarshito, wherever he may be and whoever he may deal with: his home, a dark discothèque, designing a family dwelling, exhibiting his work, or lecturing on his projects in universities, performing or conferencing, Tarshito is known to be one ~ in his life and work, in proposals that he addresses to other people, and those that he practises for himself. An outsider to trend and an insider to inspiration and motifs that, according to him, come to Earth directly from the Sky, Tarshito uses materials and symbols that belong to ancient traditions and cultures, committing his work to the present, aspiring to contribute to the future. Open to any technique, skill or crafts people, he makes them his best allies, together aiming for the best results. Since the 1980s he has involved designers and artisans from the simplest to the most highly renowned, exalting in their talent and creativity. Having first come to India in 1979, Tarshito had spent several months with carpet weavers in villages of central India. In 1986 that resulted in the stunning production “Carpets of Medi tat ion” in 1987. Then, through a series of working relationships with the most highly- skilled craftmasters in India, he held an exhibition at the Crafts Museum of New Delhi entitled The Gold and the Clay, establishing himself as one of the most convincing interpreters of art as a “confluence of traditions”. From carpet-weaving to embroidery, terracotta modelling, to miniature painting from the remote tribal traditions, to expressions of devotion, Tarshito’s art defines itself in terms of shared inspiration and close personal interaction, revealing throughout a commitment to discovery and research. Conceptualised by the Rome-based art curator and journalist Daniela Bezzi, his London exhibition had documented over 20 years of creative collaboration with Indian craftspeople by Tarshito. Arts of the Earth will certainly be an inspiring experience.